The Diamit Corporation offers complex solutions uniquely for each sector of the building industry in the area. Established in 1992, the company has continually expanded its lines of business year by year as well as increasing the number of constructive jobs. Industrial construction represents the main line of our corporation. In the past few years we have carried out many gas-pipe laying infrastructures as well as drinking water supply reconstructions in different areas. Within The Europe Plan we attained Sirok’s clean drinking water maintenance and supply from Lázbérc’ s water tank, the storage reservoir of Lázbérc. Between 2007 and 2011 we achieved over 1 milliard forint by creating drinking water supply reconstruction jobs in the area of North Hungarian Waterworks Ltd. Since 2007 we’ve accomplished sewage disposal in different towns and villages in exchange for more than 3 milliard forints. Last year through ‘The Environment and Energy Operational Program of New Hungary Development Plan’ we attained a DN 400 diametrical reconstruction of a heating pipe, which 1500 m in length. As well as the system of public utilities, we have built many drives and woody paths for Nyírerdő Zrt. And Északerdő Zrt. This year we’ve finished the constructions of the biggest rainwater disposal system in Borsodszirák with a value of 400 milliard forints. Our corporation has bank accounts with Sajóvölgye Takarékszövetkezet, Boldva és Vidéke Takarékszövetkezet and K&H Bank. The line of our business changed towards hydraulic- and structural engineering in the last period. 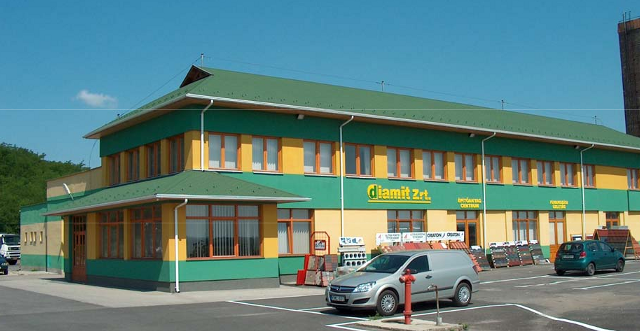 Our line of business has been expanded significantly by buying the company, Gátépitő Ltd. in 2006. This caused hydraulic engineering to come into existence. As well as flood-prevention, the first significant job was the reconstruction of the river Tisza, near Tokaj. In the past few years we carried out much reconstruction of the water supply (area of Karcsa). This includes stream-reconstructions, river bed adjustments (Szuha-patak, Laskó-patak, Vadász-patak, Nyögő-patak), water storage reconstruction (Laskó-tározó, Varbói-tározó) for the North Hungarian Environment and Watersupply Directory, which we won through public procurement procedure. Since the construction of the Renault Szalon és Szerviz in Szirmabesenyő, the modernization of public institutes and the rationalisation of energy are significant examples of improved structural engineering (Kazincbarcika, Felsőkelecsény, Járdánháza, Borsodnádasd, Sajóvelezd). Renovations of primary schools are worth mentioning in Borsodnádasd, Múcsony, Felsődobsza as well as the energetic modernization of Adam Jeno- and Dozsa Gyorgy Primary Schools. Besides the jobs we won through the public procurement procedure we have to mention the expansion of the rubbish disposal & waste handling center in Hejőpapi, for the Ave Heves Régió Ltd. 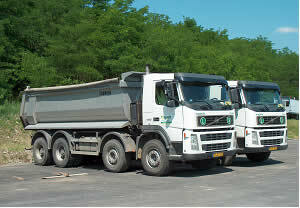 Furthermore, there is building of another two waste handling centres in Eger and Hatvan. Our corporation became one of the most dominant companies by finishing those jobs mentioned above. Our corporation became one of the most dominant companies by finishing those jobs mentioned above. In the past few years the profit was used up for developments and innovations. This is why we can provide the highest standards of technical equipments. 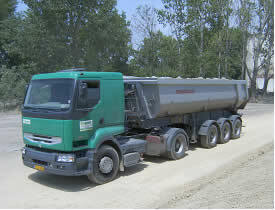 These include the worldwide known JCB field-work machines; Mercedes dump truck, Volvo four axials, Renault semitrailer trucks, and many small machines. In 2010 our implement tool park was expanded with 8 new JCB 4CX universal field-work machines. We have bought a JCB 260 Long-necked, turned bagger as well as a JCB JS 200 rubber wheel bagger with a breaking spoon attachable. For continuous and guaranteed quality we introduced the quality assurance system accordance based on the regulation ISO 9002, which applied from 12th august 1999. This changed from 1st October 2002 based on the regulation MSZ EN ISO 9001:2001 (ISO 9001:2000). The environment-centred system was brought in on 18th December 2002 accordance with the regulation MSZ EN ISO 14001:1997. Both systems are maintained and controlled on a regular base. Health and Safety at Work was introduced on 30th November 2010 accordance based on the regulation MSZ 28001:2008 (OHSAS 18001:2007). In industrial construction, excellent quality and high accuracy are essential. In the interest of quality development our corporation purchased plenty of new appliances. We have the latest quality-monitoring equipments (carrying capacity and solidity measuring devices, electric manometer, drain investigator with camera), complex geodesic equipments (drain layer laser, monitoring station with GPS), which help in the quality construction, accurate localization, correct, and high-level demonstration of the outcome. Our corporation possesses a waste handling and transportation licence (constructive and knacker rubbish) and the mobil technology, which is needed for the process. The recycling happens in the field. This system and the modern equipments make it possible to use up the scrap for building material. As for the developments in 2007 we have to mention the expansion of our selling-trading sector with the opening of the building material centre at our headquarters. 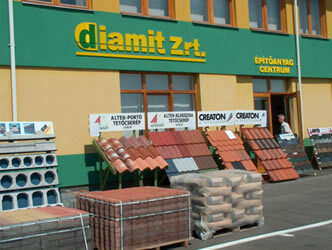 (Diamit Building Material Center). Having served our own constructive demands, they are available for potential customers too. As the orders regarding work increased so did the number of employees and also the professional and technical level became higher. Through the informatics and procuration system based on modern computer engineering, we assure the constant communication with landline phones and at least 200 mobile phones. The number of employees has increased in the past few years. As well as the full time employees, the number of sub-contractors exceeds 300, so altogether we provide continuous employment and regular incomes for nearly 500 people. The centre in Múcsony located on 10 hectares area, where we established a smaller industrial park with companies such as Swietelsky Építő Ltd, or Den Hartogh Ltd. who is dealing with transportation. Our future plan is to exceed our potential and to keep improving our great customer service. We serve our potential and current customers with our technical and financial capability, the constant improvement of our experts and the satisfaction of our clients by assuring the highest standards of quality in a wide range. 3910 Tokaj, Benedek Pál út 25. 3700 Kazincbarcika, Irinyi J. út 1.